This article shall address the concerns, questions, and act as a comprehensive guide to an injured party involved in rear end collision motor vehicle accidents. Any motor vehicle accident, especially a rear end accident, in which you are the rear end car, can be a chaotic experience. Who is at fault in a car accident rear ending? When is a rear end collision not your fault? When the driver in the back may not be liable? Rear-end collision when the lead driver may be at fault. What to do when you get rear ended by someone. Rear end collision insurance claim. What can a rear end attorney do to help? What is a Rend End Collision? Believe it or not, rear ended car accidents are very common and result in accident injuries. 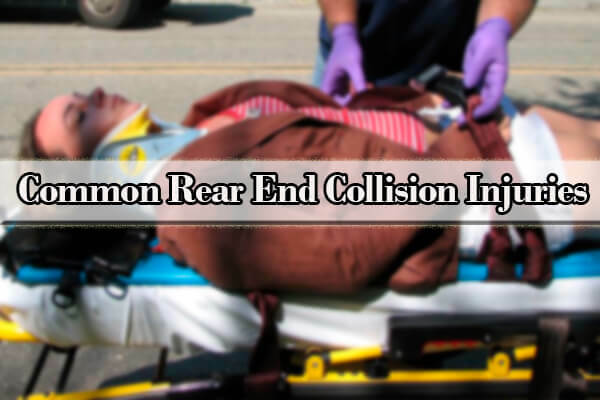 A rear ended car accident or rear ended accident or what is commonly known as rear end collision case is exactly what it sounds like. The car in front or the driver in front is hit from behind by the rear driver. Oftentimes, the front driver may have stopped suddenly, causing the rear driver, who is most likely following too close behind, rear end the front driver causing a rear end accident. If you are the victim of such a rear end collision, you’ll definitely want to involve the police so that a police report can be made. Oftentimes, in these types of cases, the instinctive reaction for both front driver and rear driver is to just exchange insurance information and move along, especially if the property damage to each driver’s vehicle is minimal. However, doing so can greatly jeopardize the front driver’s ability to pursue any liability claim against the rear driver, especially since it is very common that any symptoms from such an injury, no matter how large or minor, may not manifest itself until well after the crash or collision actually occurred. Oftentimes, a victim in a rear end collision may not experience any immediate pain or symptoms right away, and the victim will refuse medical treatment or tell someone that they are not injured. Then, maybe later that day or a day or two later, the symptoms will manifest and then the victim will feel the need to seek medical treatment for their injury. However, since the front driver had previously just exchanged insurance and driver information, did not contact the police and make out a police report, there is no official documentation stating who was at fault. A police report helps establish rear end collision fault, and so you should always contact the police to report the accident and have the police make a report, even if at that moment in time you feel that the property damage is small or your bodily injury is minimal. Once the police arrive, they will observe the scene of the accident, interview the front driver, rear driver, and any witnesses, and make a determination if any traffic laws were violated. However, the police officer may not always provide a ticket to the rear end driver for a traffic violation. But that does not necessarily mean that the rear end driver is still not at-fault. Under these circumstances, it is highly advisable to seek the counsel and advice of a car accident attorney or law firm. These types of attorneys will be able to analyze the facts, conduct their own investigation, and present evidence to show that the rear end driver was the one at fault, and not you. In most states, particularly New York, the standard law is that the rear ended driver must allow ample space between themselves and the vehicle in front, and therefore not follow too close behind the front driver. Accordingly, there is a presumption that if there is a rear end and collision case, that the rear driver or the driver who hit the front driver is automatically to blame for the collision in that they did provide enough space or room to stop, even if the front driver had to stop suddenly. Sometimes, however, the rear driver or the driver who hit you may not be liable. 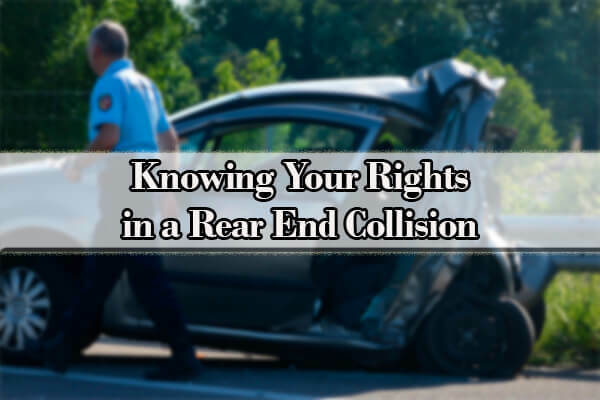 For instance, if a rear driver collided into your rear as a result of being hit by another driver from behind, that rear driver who rear ended you may not be entirely legally liable for your property damage and personal injury, since it was the other driver that caused the accident in the first place. Or, for instance, if the rear driver or the driver who hit you had some type of reasonable explanation to justify rear ending the front driver and causing the auto accident, then such an reason may mitigate the liability against that rear end driver. Again, if the rear driver provides such a defense, then the front driver should always seek the advice of an experienced personal car accident attorney or law firm. They will know how to address such defenses. When Is The Front Driver At-Fault? Obviously, if the front driver is ticketed for some kind of traffic violation that is relevant to the cause of the accident, then providing that the front driver was not at-fault may prove difficult. These types of tickets do not include being ticketed for not having insurance or driving without a license since these types of tickets are not a cause for the rear end collision occurring. However, tickets involving moving violations, speeding, or illegal lane change would affect the cause of the accident and may undermine the front driver’s liability. However, even if the front driver is ticketed for a traffic violation and they are partially at fault, that does not necessarily mean that they are barred from recovery against the rear driver. In personal injury law, under the doctrine of negligence law and comparative negligence, a claimant’s negligence, no matter how great, will not bar recovery, but the damages recoverable will be reduced in proportion to his negligence. Accordingly, if the front driver is found to be 30% liable for the accident and the rear end driver is found to be 70%, the front driver’s pain and suffering endured will only be reduced by 30%. Incidentally, New York is a pure comparative negligence state, so again, even if you may have been ticketed in the accident and are found to be partially at fault for the accident, that does not necessarily mean that you are barred from recovery. When it comes to rear end injuries, common car accident injuries symptoms include soft tissue injuries. These types of injuries involve inflammation of the muscle, most commonly back pain and neck pain, most commonly known as whiplash. These types of common injuries from being rear ended are not permanent in nature, meaning even though the front driver may experience soreness and pain, once the inflammation goes down, over time, the symptoms will subside and go away. Another common soft tissue injury is when the front driver may be sore after the car accident as a result the seat belt injuring the driver’s chest. Oftentimes, the driver will experience soreness along his chest and there may even be marks or scars from the impact of the seat belt. Other injuries may involve traumatic brain injury, broken bones, disfigurement, partial or full paralysis, spinal cord injury, headache after being rear ended, fractures, bulging discs in the back or neck, and possible nerve damage. These type of rear end injuries and post car accident symptoms may be more permanent than just soft tissue injuries. What should you do when you get in a rear ended car accident in which you are the rear ended car? After you secure your safety and the safety of any of your passengers, you need to consider reporting the accident right away. In doing so, you should contact the police immediately, no matter how small or minor the property damage or your bodily injuries. Again, this will establish official documentation as to who is at fault and the cause of the rear end accident. The next thing you should is to try to gather evidence. You can speak with the rear end driver to determine if they make any admissions or guilt or fault. Next, you should take pictures of any property damage of the vehicles as well as the scene of accident. You should make note of any skid marks on the ground, the conditions of the road, and the weather conditions. You should also make note of any witnesses who may have seen the accident. You should document their names, addresses, and phone numbers. Finally, you should seek medical attention immediately. Oftentimes, a front driver may wait to go see the doctor. Doing so may deter the validity and legitimacy of any pain and suffering you’re claiming. If you suspect any injury, even if just to get examined as a precaution, then you should seek medical attention immediately. What should you expect when you get in a rear ended car accident in which you are the rear ended car? The rear driver may be belligerent, uncooperative, and may be very defensive. Don’t expect that the driver will be very cooperative and voluntarily say that they are the one at fault. Also, since you would have just experienced a very chaotic accident, it may be difficult to gather your information. Accordingly, if you are unable to do any of the above, the most important thing you can do is call the police so that they may investigate the matter. Also, contact your personal injury attorney. Once things have settled down, you’ll want to file a claim against the rear driver as soon as possible. Since insurance companies try to prevent their liability exposure at all costs, you’ll want to contact an experienced car accident attorney or law firm in order to avoid the insurance company from using your words against you. The one thing you do not want to do is provide a written or oral statement to the insurance company as to what happened. Your attorney should provide the statement on your behalf or with you; you should not provide it yourself. Your attorney will then file the claim on your behalf. After your claim is filed, you will then follow-up with your medical physicians in receiving the treatment you need for your injuries. This treatment may be small and be as little as just a few appointments, or it may be extensive, and involve surgery and being off work for several months. Once you are done treating and at maximum medical improvement or MMI, your attorney will gather all of your medical bills, medical expenses, the police report, documentation of any lost wages, evidence of any permanent disability, and any evidence to indicate your pain and suffering that you’ve endured, and will send a demand letter to the rear driver’s insurance company to compensate you for your pain and suffering. Even if the rear driver has little coverage or no auto insurance whatsoever, a claim can still be filed under your uninsured or underinsured motorist policy. Or, even if you are found to be partially at fault, a claim can still be filed under the comparative negligence doctrine, in which your pain and suffering shall be according to what degree you are at fault. When your attorney files a demand to seek compensation for damages, they are seeking damages and compensation on your behalf for the pain and suffering you’ve endured. Pain and suffering is proven by a number of factors, most common of which is the medical expenses endured. The higher the medical expenses and bills, theoretically, the more pain and suffering is you may have endured. Another factor that is sometimes taken into consideration is the property damage to each vehicle. If both vehicles have little or no property damage, then the pain and suffering endured is thought to be less too. Other factors include permanent bodily injury, lost wages, and any other evidence, including mental trauma. 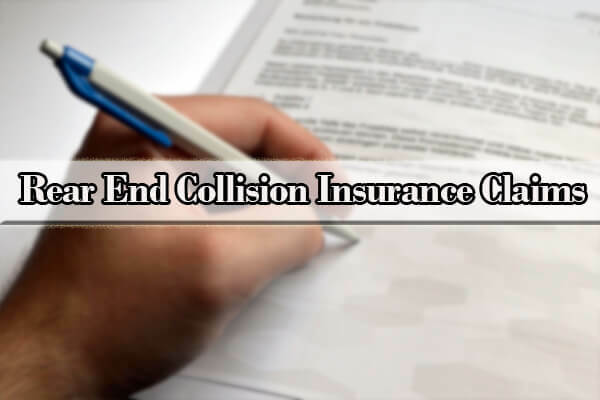 Accordingly, you should always contact the legal advice from a car accident attorney or law firm when considering a settlement amount and in determining how much your collision settlement is worth. They will have the experience and knowledge to know what is proper and fair. Q: Who is at fault when you get rear ended? A: The most important factor when you get rear ended is determining who is at fault. New York follows the comparative negligence doctrine, which means that what percentage a person is at fault will determine how much they can claim in damages and pain and suffering. In reporting the accident, you should contact the police so they can provide an official statement if any traffic laws were violated. Q: What is the main cause of rear end collisions? A: The main cause of a rear end collision if following too close behind the front driver. This is mostly caused by speeding or distracted texting. Q: Are rear ends always at fault? A: Rear end collisions by the rear driver does not always means that the rear driver is the one who is at fault. The rear ended driver may be partially to blame too. Again, New York follows comparative negligence when it comes to recovery. Q: What kind of injuries can you get from a rear end collision? Q: What to do when you are rear ended by someone. Q: What happens to your body when you get rear ended? pain or symptoms right away. Your body may be in shock, and it may take awhile for the pain and symptoms to manifest. Q: How much is a rear end accident worth? A: The amount a rear end accident is worth is based upon the pain and suffering endured. This is based upon a number of factors, including, medical expenses and bills, lost wages, permanent impairments, property damage, and any mental trauma. A rear end accident attorney or law firm is crucial in evaluating who is at fault, even if you are found partially liable, gathering evidence to make your case stronger, and in providing you the best car insurance settlement possible. 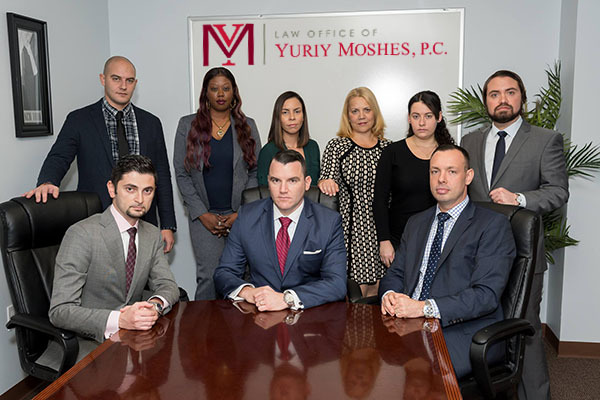 At Law Office of Yuriy Moshes, we know how to fight and win rear end collision accident and injuries. We represent front drivers in the greater New York City area including all its boroughs, including Manhattan, Brooklyn, Queens, the Bronx, and Staten Island) as well as Northern New Jersey, Long Island, and Upstate New York. We can also provide a consultation if you are the one who rear ended someone. If you were in a rear end accident and wish to discuss your case, we provide a free consultation.